Sticky Mat Supply brings you over 28 years of sticky mat experience. We are proud to offer you the most comprehensive selection of high quality tacky mats such as: sticky mats, clean room mats; tacky mats, adhesive mats, carpeted sticky mats and reusable sticky mats. We welcome the opportunity to help you with any of your floor mat needs. Please feel free to call or email one of our sticky mat specialists for immediate assistance. As always, help us help you keep your floor free of dirt, dust and debris. Sticky Mats are necessary to keep sanitary-sensitive areas free and clear of foreign substances and help improve indoor air quality. Remove and trap unwanted dirt, dust and debris. Sticky mats barricade sterile environments. Carpeted clean room mats have 2 defensive layers against contaminants entering sanitary-sensitive areas; a carpeted entrance mat on the front half and a sticky mat on the rear portion. 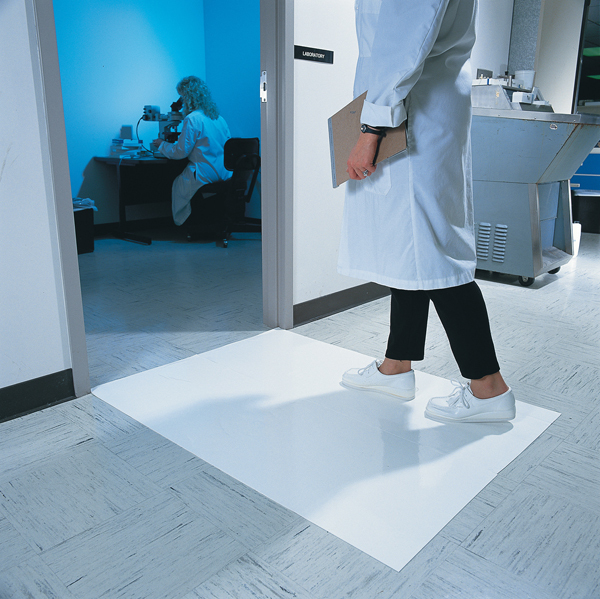 Carpeted clean room mats protect sensitive equipment and sterile environments. ReUsable Sticky Mats are high performance, industrial strength contamination control clean room sticky mats. ReUsable sticky mats are ideal for inside and outside critical areas, such as ISO certified clean rooms and laboratories. We want to earn your business. That is why we are committed to delivering mats at the lowest possible cost to our customers. If you happen to find a lower total cost (inclusive of shipping, fees, tax, etc.) Sticky Mat Supply will give you 110% of the difference.